Drivers should be alert to the presence of crossing guards when near a school and must always obey their instructions. It causes the driver to be concerned about the cost of the call. It occupies the driver's hands, eyes, and mind. It is an activity that draws the attention of other drivers. Using a cell phone while driving is dangerous because it occupies the user's eyes, hands, and mind. Even the most skilled drivers increase their risk of being involved in a crash by using a cell phone on the road. Drive only in the direction of the arrow. Regulatory signs provide notice to road users of traffic laws that must be obeyed. 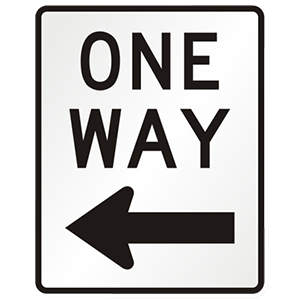 Where this sign is present, drivers must drive in the direction indicated by the arrow. When being passed, you must yield to the passing vehicle and not increase your speed. Allow the vehicle to safely merge back into your lane.